An effective skincare routine includes a gentle cleanser, skin-replenishing toner, exfoliant, sunscreen that includes antioxidants, and a nighttime moisturiser loaded with antioxidants. But that’s just the beginning of lasting vibrancy. The additional products you use can play a significant part in achieving glowing results. What you apply after exfoliating but before your serum and moisturiser is the pivotal step that can reveal dazzling results. 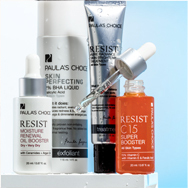 The products we encourage you to consider are our RESIST Pure Radiance Skin Brightening Treatment and our C15 Super Booster. Vitamin C’s role in creating dewy, radiant skin comes from its ability to defend skin from environmental damage that causes dullness and makes skin look ashen or sallow. Vitamin C is a natural substance in skin that needs to be generously replenished in order for it to have a potent impact on skin’s appearance. When skin has an ongoing supply of topical vitamin C, it becomes renewed and revitalised, producing a lustre from the inside out. It’s relatively easy to add the key products mentioned above to your daily routine for radiant results you’ll love seeing every time you catch your reflection in the mirror. But the routine above isn’t just about brightening: You’re also getting anti-ageing benefits, superior hydration, and specialised ingredients that create a visibly more even skin tone. We can’t forget to mention how astonishingly silky your skin will feel, too!